Hallelujah runs 4 night trips to the Similan Islands and Richelieu Rock through the season from mid October to end of April. The MV Hallelujah was a new arrival on the scene for the 2012 season, and has been one of our best selling boats for the last 5 years. Hallelujah prices are very reasonable - it's a really big comfortable steel hull boat, 35m long. All cabins have aircon and en suite bathrooms, and there's a huge amount of space to relax even with capacity 25 guests. Early Booking Offer : 10% Discount on trips in October 2019, November 2019, December 2019, January 2020, April 2020! Hallelujah was built in 2002 and started operations as the ‘Viking of the Orient’ before being used for private charters for a few years. The boat was refitted and started operations as the Hallelujah in November 2011. 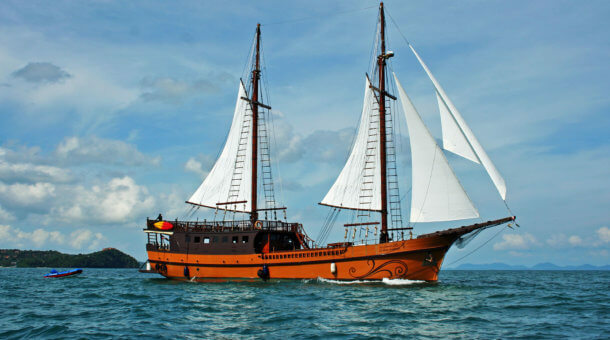 She’s a very big boat – 35m long with lots and lots of space including a large indoor aircon saloon and a big sun deck. 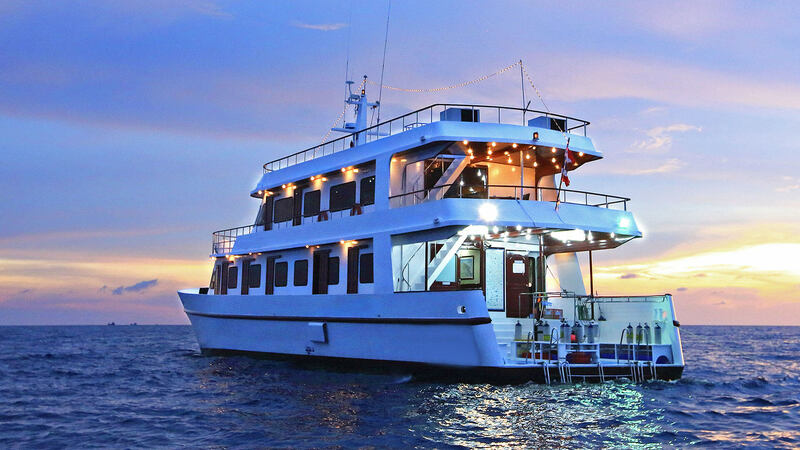 The Hallelujah will take 25 guests maximum – the main deck has 10 twin bunk cabins and 2 larger double bed cabins which are right at the front of the boat, all cabins have big windows, doors to the walkway outside, bathrooms and aircon. There is also a VIP single cabin on the top deck behind the wheelhouse. It’s a very comfortable boat. And safe too – equipped with 4 Life Rafts, full complement of life jackets, medic first aid station, Oxygen supply 6,000 liters capacity, Closed circuit video on the dive deck and in the engine room. 2 large dinghies (RIBs) will assist with diver pick up since the Hallelujah is too big to go cruising near the reefs. The dive deck is also extremely spacious and well organised. Hallelujah departs from the port of Thap Lamu, 90 minutes North of Phuket. Transfers from Phuket or Khao Lak are included in the prices. Pick up also possible from Phuket International Airport. 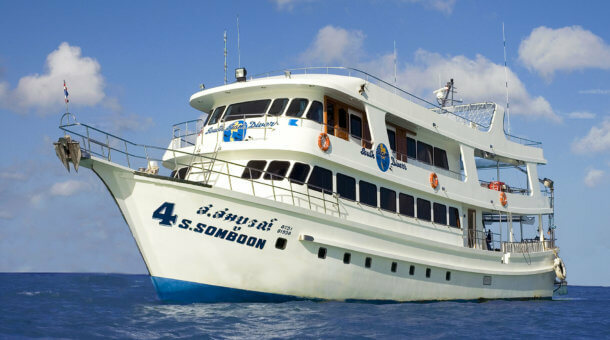 Rental equipment is provided by Sunrise Divers for our divers on the Hallelujah liveaboard. Rental price is 500 Baht per day for a set (BCD/regulator/fins/mask/wetsuit) and 250 Baht per day for a dive computer. We have a large equipment room at our dive center with 30 sets of Aqualung BCDs and regulators and a large selection of long and short wetsuits, open heel and full foot fins. Torches for night dives are 150 Baht per day. 15 liter tanks 200 Baht per day. 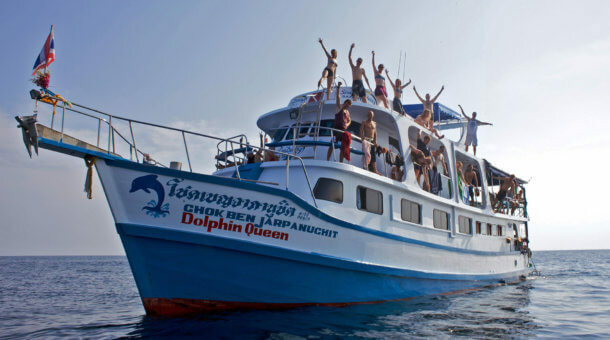 Nitrox is available on board @ 250 Baht per 12 liter tank fill or 2,500 Baht for all 14 dives on a trip. 15 liter Nitrox 300 Baht per fill or 3,500 Baht for all 14 dives. SSI Advanced Open Water course is 7,000 Baht. SSI Enriched Air (Nitrox) course is 7,000 Baht. Drinking water, coffee, tea, sodas are included. Beers are 70 Baht and wine 100 Baht per glass. 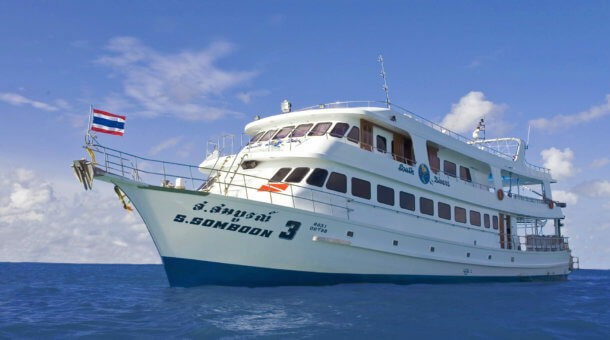 Hallelujah runs trips for 4 nights to the Similan Islands, Koh Bon, Koh Tachai and Richelieu Rock through the season from October to April.